I had a recipe for pumpkin waffles that required the batter sit in the fridge overnight, intending to make the batter on a Saturday night so we could have them for breakfast on Sunday. Time got away from me and it was too late to start making waffle batter, so I decided to search for a recipe in the morning that didn't require an overnight incubation. Thankfully I found this one on Smitten Kitchen. We loved these waffles! The whipped egg whites make for a fluffy interior, and the outside is still nice and crispy like a waffle should be in my opinion. These sort of taste like pumpkin bread! 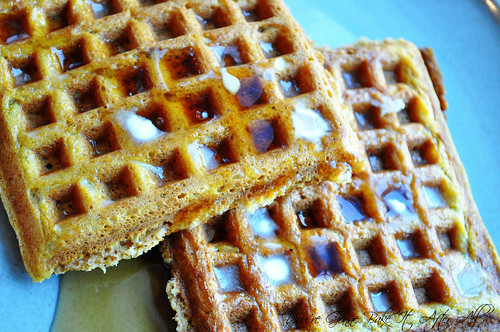 This recipes makes a lot of waffles, so we have the leftovers in our freezer. I look forward to being able to pop one in the toaster for a quick weekday breakfast! *Or use 2 cups milk with 2 tablespoons vinegar and allow to curdle for 10 minutes. 1. Sift together flour, brown sugar, baking powder, baking soda, salt, and spices. 2. Whisk egg yolks in a large bowl with buttermilk, pumpkin, and butter until smooth. Whisk in dry ingredients just until combined. 3. In a mixing bowl with a whisk attachment, whisk the egg whites until they hold soft peaks. Fold them gently into the waffle batter until just combined. 4. Brush waffle iron lightly with oil or spray with cooking spray (I like to use Pam for Grilling because it's a high temperature formula and holds up better to heat of my waffle iron). 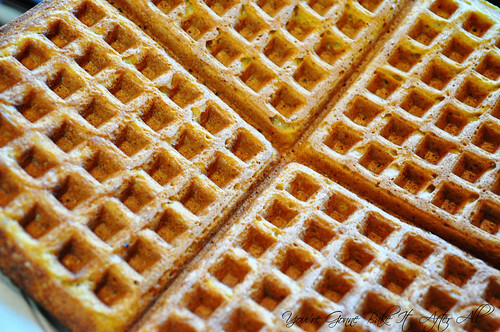 Pour or spoon batter into waffle iron, spreading quickly. Cook according to manufacturer’s instructions. (When I make waffles, I like to transfer the batter to a pourable measuring cup and pour it onto the waffle iron. I don't even bother spreading the batter because the weight of my waffle iron's lid spreads it nicely). 5. If serving many people, transfer waffles to rack in oven to keep warm and crisp. Repeat with remaining batter. I just cool my extra waffles on a cooling rack, break up the squares, wrap them in waxed paper, and pack them up in freezer bags. Then they are ready to pop in the toaster from frozen. Just made these tonight—delicious! 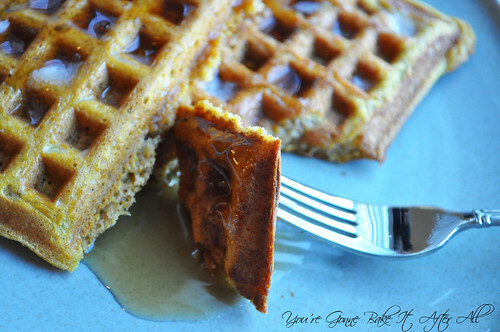 Like pumpkin pie in waffle form! I subbed 1 cup wheat flour and you couldn't even tell. Reposting the recipe soon! Thanks!